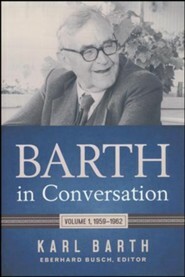 In recognition of Karl Barths stature as a theologian and public figure in the life of Europe and the West, Swiss publisher Theologischer Verlag Zurich (TVZ) published Conversations, a collection of correspondence, articles, interviews, and other short-form writings by Barth. 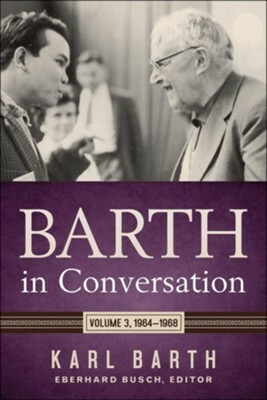 Collected in three volumes, Conversationsreveals the depth and breadth of Barths theological thought as well as his humor and humanity. Now, for the first time in English, the third and final volume is offered here. 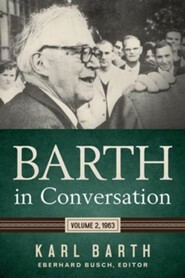 Volume 3 covers the period from 1964 to 1968, the year of Barths death. As such, it represents the culmination of the great theologians thoughts on a broad range of subjects, from the challenges of living as the church in an increasingly secular world to the distinctive joys and challenges of the pastoral vocation. Karl Barth (1886-1968) was Professor of Theology at the University of Basel, Switzerland. One of the greatest theologians and preachers of the twentieth century, he is best known for his monumental systematic theology, Church Dogmatics. He is widely regarded as the most important theologian of the twentieth century, and his observations about the church and its place in a modern world continue to engage scholars of religion more than fifty years after his death. Eberhard Busch is Professor Emeritus of Reformed Theology at the University of Göttingen, Germany. A one-time student of and personal assistant to Karl Barth, he is a world-renowned authority on Barth and author of Karl Barth: His Life from Letters and Autobiographical Texts. Karlfried Froehlich is Princeton Theological Seminary's Benjamin B. Warfield Emeritus Professor of Ecclesiastical History and serves as German editor for Barth in Conversation. His special interest is the history of biblical interpretation, especially in the Middle Ages, Christian iconography, and ecumenism. Darrell L. Guder is Princeton Theological Seminary's Henry Winters Luce Emeritus Professor of Missional and Ecumenical Theology and serves as English editor for Barth in Conversation. His writing and teaching focus on the theology of the missional church, especially the theological implications of the paradigm shift to post-Christendom as the context for Christian mission in the West. David C. Chao is a PhD candidate in theology at Princeton Theological Seminary and serves as Project Editor for Barth in Conversation. His research interests include Protestant and Catholic dogmatics (especially as they pertain to issues of nature and grace), Reformed theology (classical and modern), and Asian American theology. I'm the author/artist and I want to review Barth in Conversation: Volume 3: 1964-1968.